"Yesterday Coastal Gaslink contractors illegally bulldozed through one of our traplines. Damage to the trapline is a direct attack on our healing center and the well being of our Wet'suwet'en people. CGL continues to disrespect our yintah, our culture and our traditions." "Settlers don't always like to admit their mistakes..."
Coastal GasLink says it temporarily shut down work in Wet’suwet’en territory Thursday due to safety concerns. CGL says a number of unauthorized people entered an active construction zone to place traps, which it says puts both heavy equipment crews and trappers at risk. Unist’ot’en members say Coastal GasLink workers blocked access to Wet’suwet’en traplines. ?They say they’re also concerned about their sweat lodge, which they fear might be damaged in the future. The developments follow?accusations earlier this week by Unist’ot’en members that CGL crews conducting preliminary work for the Coastal GasLink pipeline bulldozed through one of their trap lines. In a Facebook post, the Unist’ot’en said the damage represented a direct attack on their healing center, the wellness of the Wet’suwet’en, and is a violation of the Wildlife Act. Coastal GasLink continues to bulldoze our trap lines and destroy our land, pushing Wet’suwet’en people aside with support from the RCMP. The destruction of our trap lines is a direct threat to the programming of our Healing Centre and the wellness of our clients. We know from our oral histories that this area, now being destroyed for a CGL man camp, has been used by our trappers for thousands of years. To date, Coastal GasLink has still not undertaken proper consultation or made any agreement with our Hereditary Chiefs. We do not consent to any aspect of this project. We have notified CGL that they are in violation of the Wildlife Act, but they continue to deny us access and destroy our traps. Now, our trappers are being told they face arrest if they attempt to access their traplines, while CGL bulldozers are being permitted to plow through them. In this video, Unist’ot’en member Brenda Michell speaks to CGL contractors and RCMP. RCMP Officer Cook is seen consulting with CGL employees before threatening Michell with arrest. Rush hour drivers in downtown Edmonton saw an unusual traffic disruption Tuesday afternoon — a protest in a busy intersection. The intersection on 104th Street and Jasper Avenue was blocked for nearly an hour starting at 5:45 p.m., as about 100 people took part in a round dance. Police helped re-direct traffic around the drummers and dancers. Members of Indigenous Climate Action and?Climate Justice Edmonton organized the event to show solidarity with members of the?Wet'suwet'en Nation in northern B.C., who have been protesting the construction of a natural gas pipeline on traditional territory. "This event with the RCMP going in with militarized equipment onto unceded land is Canada again committing settler-colonial violence," said Thundering-Antler, who noted his family is made up of residential school survivors. "I wasn't able to stand up against the government and the RCMP when they were taking children away, but I am able to do something today." The Downtown Eastside Women’s Centre (DEWC) stands in support with Unist’ot’en Camp and Wet’suwet’en Leadership in their peaceful defense of Wet’suwet’en lands in northern British Columbia against Coastal Gaslink Pipeline. The 1997 Delgamuukw-Gisday’wa case confirmed Wet’suwet’en’s title and rights to these lands as represented and held by their hereditary leaders; moreover, these lands are unceded. DEWC membership is comprised of majority Indigenous women, low-income and working class women, most of whom are survivors of violence. DEWC recognizes that the same systemic violence that deeply affects Indigenous women takes many forms: in this case, militarized enforcement by the government removing unarmed women and Elders from their traditional lands, disrespecting hereditary leadership, and disrupting healing work and ceremony. Unist’ot’en conducts invaluable work for Indigenous people affected by intergenerational trauma, substance use, abuse, and other lasting effects of colonial violence (ex. residential schools and cultural genocide), work that is imperative to women in the Downtown Eastside community and to true reconciliation. We condemn the actions of the federal and provincial government, the courts and police in granting the injunction to TransCanada’s Coastal Gaslink project and criminalizing Indigenous people protecting their traditional lands and territory. In 2016, the government of Canada signed onto the United Nations Declarations of the Rights of Indigenous People (UNDRIP) as a full supporter, without qualification. UNDRIP mandates free, prior and informed consent for any project crossing Indigenous land, which has unequivocally been denied by all five Wet’suwet’en clans. Article 10 of UNDRIP clearly states that “Indigenous peoples shall not be forcibly removed from their land or territories,” while at Gidimt’en Access Point, militarized RCMP arrested land defenders with snipers and automatic weapons on hand. We strongly urge the implementation of UNDRIP at every level, the fulfillment of the Truth and Reconciliation Commission (TRC)’s 94 Calls to Action, and concrete acknowledgement — and sustained action — on the severity of violence faced by Indigenous women. DEWC is a non-profit that receives government funding for our work of providing refuge, vital needs, and a spectrum of support to women in the Downtown Eastside. We call on all levels of government to recognize that violence against Indigenous land, violence against water protectors and land defenders, and violence against women are interrelated: in the Downtown Eastside and across Turtle Island (North America). Over the weekend Coastal GasLink willfully, illegally, and violently destroyed Gidimt’en cultural infrastructure and personal property on Gidimt’en territory without our consent. This was our infrastructure to be on our land and exercise our land-based culture. Coastal GasLink’s attack on our cultural practices - with RCMP’s active complicity - is an attack on our sovereignty and an attack on our way of life. ..at the bottom of this support piece is a very long list of musicians who have signed on. On January 7th, 2019 we watched, infuriated as a militarized RCMP forced the removal of 14 land protectors from Wet’suwet’en territory at gunpoint. The continued invasion of unceded Wet’suwet’en land by Coastal GasLink pipeline workers without your consent violates Section 35 of the Canadian Constitution, the?United Nations Declaration of the Rights of Indigenous People?and ‘Anuc niwh’it’en (Wet’suwet’en Law). We have heard your hereditary chiefs say “No” to the Coastal Gaslink development and we intend to amplify it.? We call the Canadian government to account.? As musicians, we know a PR campaign when we see one: since 2015 Justin Trudeau has promoted a message of Truth and Reconciliation and professed the goal of building meaningful nation-to-nation relationships, but his government’s actions don’t align.? Meaningful nation-to-nation relationships are not made at gunpoint.? In response to questions regarding the violence in Wet’suwet’en last week, Trudeau said that it wasn’t “ideal” but that Canada is?“a country of the rule of law”?inferring that his hands were tied. In fact, he was sidestepping the inconvenient truth that the Supreme Court of Canada found in the 1997 Delgamuukw decision that Indigenous land rights and title were not extinguished at the time of colonization.? As such, the Canadian rule of law states that Wet’suwet’en nation’s hereditary leaders have decision making power on their unceded territory. ..watch the video to see the speaker make his case. Our Elders wept as they surveyed the damage left behind by CGL at a trapping site our people have always used. A day after a sweat ceremony, with RCMP threatening the arrest of our trappers and healing centre clients, CGL contractors illegally destroyed the rest of one of our traplines. We see daily how RCMP permits CGL to break Canadian laws, while we are threatened with arrest for exercising our rights and title. We have never ceded or surrendered our rights to this land, and we never will. We abide by their injunction and all that we have asked is that they uphold their own laws. The RCMP has openly violated its agreement with our chiefs. They waste our time daily. CGL continuously harasses our healing centre clients, while RCMP threatens enforcement. Canada hates us. Canada hates Wet’suwet’en, Mi’kmaq, Tahtlan, Nehiyaw, Anishinaabe, Kaska, Denesuline, Secwepemc, and the list goes on. Canada hates us all. 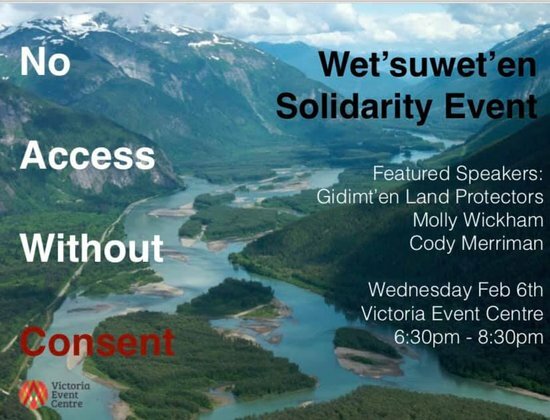 But Wet'suwet'en land defenders have been fighting to protect their land and sovereignty for decades -- including the 1997 Delgamuukw-Gisday’wa court case and the Unist'ot'en Camp that has blocked pipelines and healed the land since 2009 -- and they will not stop here. A round dance in solidarity with Wet'suwet'en blocks an intersection in Edmonton on January 22. Photo by Abdul Malik. couldn't get angrier after this. Nearly five years later, the events surrounding Polak’s jaw-dropping turnaround are worth revisiting in light of the current government’s overhaul of B.C.’s Environmental Assessment Act — the same piece of legislation that Polak so ill-advisedly set out to change. Those documents clearly show that Canada’s preeminent fossil fuel industry lobby organization — the Canadian Association of Petroleum Producers — wanted the change that Polak signed into law. In so-called Canada, urban Indigenous organizers are re-energizing a decades-old struggle by redefining Indigenous sovereignty in the city streets. 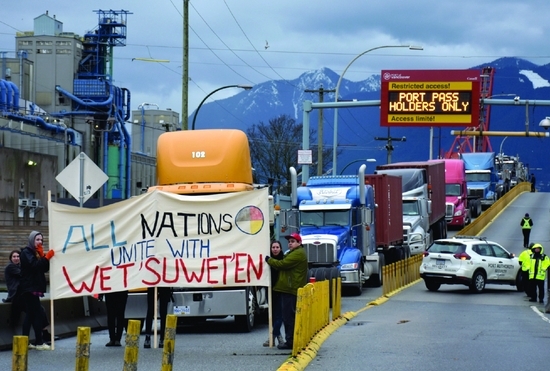 “I brought you all some water,” I said to the ragtag crew of six holding our “All Nations Unite With Wet’suwet’en” banner across the lane of semi-truck traffic heaving out of the Port of Vancouver. We had been standing, rotating positions, for five hours now. A hundred feet away, 200 people formed a square around the intersection of Hastings Street and Clark Drive, blocking semis, buses, and drivers headed to the glass towers of downtown. At the center of the intersection, Elders from local nations sang and drummed. With a pivot of their feet, they honored the four directions: north, south, east, and west. I walked back to the intersection and stood with the man from yesterday’s march. He had been making his way through the crowd, offering people sage for smudging, a common cleansing ceremony. He held out his hands. Tears blurred my vision. I brought the smudge bowl to the table under the tent and cleared away bags of chips and plastic containers of muffins. I smudged. The medicine drifted through the air, and Dennis, the man from Moricetown on the Wet’suwet’en nation, walked away, toward the east. I held the feathers until, exhausted and triumphant, we marched out of the intersection as the winter dusk fell in the late afternoon. That day, January 9, 2019, urban Native organizers led a six-hour blockade of the Port of Vancouver. We were responding to attacks by the RCMP, Canada’s paramilitary police force, on Wet’suwet’en people who have reoccupied their territory since 2010. The RCMP have been authorized by the British Columbia Supreme Court to forcibly clear a path for the construction stage of Coastal GasLink’s fracked gas pipeline. We targeted the Port because it is one of the most valuable economic sites in Vancouver, with goods worth hundreds of thousands of dollars passing through each hour. We targeted the Port to show the colonial state that Indigenous people will not sit quietly by while our cousins and comrades are under attack. Since December 10, 2018, we have organized five other solidarity actions in Vancouver. We have occupied Coastal GasLink’s corporate offices; organized three simultaneous sit-ins of New Democrat Party (NDP) politicians’ offices (the “progressive” Party in BC under whose direction the RCMP is acting); led a march through downtown that blocked two bridges; mobilized 1,500 people into the streets of Vancouver to hear inspiring speeches; and, most recently, blockaded a rail line that leads into and out of the Port. These actions have been strong, righteous acts of solidarity with the Wet’suwet’en nation in northern British Columbia. As urban Native organizers, we stand by our cousins and comrades at Wet’suwet’en. This moment of organizing is fierce, but within our own communities, we talk quietly about the absence of sustained urban Native organizing, outside of the “flashpoints” of solidarity actions that we often lead in the city for Indigenous land defenders on the remote frontlines. In settler-colonial Canada, these flashpoints inevitably come every few years, but our organizing does not sustain itself beyond our reactions to violations of Indigenous sovereignty on the land. Many of us wonder: where is our movement? 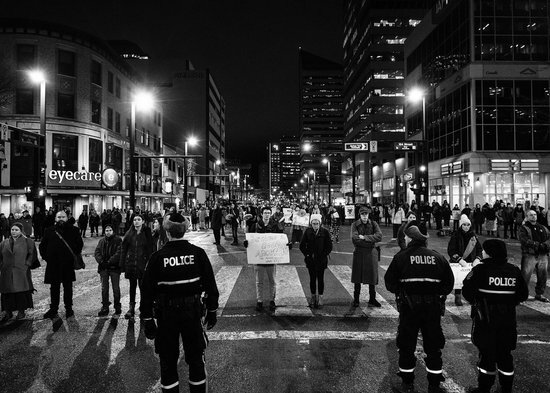 There is an incredible history of urban Native organizing in Canada and the United States. One of the most famous was the Indigenous sovereigntist Red Power movement, which was most active and visible between the 1960s and the 1980s. Many groups organized during Red Power, but perhaps the most popularly known organization is the American Indian Movement. Red Power was sparked when Indigenous fishing rights, secured through treaties, were threatened. In response, Indigenous activists in Washington State staged “fish-ins,” risking arrest to fish in their own waters. Then in 1969, the 19-month reoccupation of Alcatraz Island in the San Francisco Bay gained massive mainstream media attention and pushed issues of Native sovereignty and rights into the public discourse. Red Power was a pan-Indian movement that focused on unity between diverse Indigenous nations in the face of the colonial states of the US and Canada. ..my final addition from the above piece. In between these two tendencies, I have quietly fought to carve out space for urban Natives to make connections with our cousins and comrades at Wet’suwet’en, and elsewhere. In Vancouver, I have been organizing with an ad hoc coalitional group that includes both settlers and Indigenous people. We come from different organizations and different politics and backgrounds. Our greatest shared point of unity is the political principle of Indigenous sovereignty, and a belief, different as it may be given our social and historical positions, in our responsibility to respond to this moment of colonial attack on Indigenous sovereignty in the streets. Our work responds to two challenges: one is to create a place in Indigenous sovereignty movements to ensure that land defense politics also see the city as land; the second is to find a place for Indigenous struggles within class-based urban grassroots movements, which tend to elide the very real forces of colonialism that also structure the city. In addition to my involvement with Wet’suwet’en solidarity organizing, I have been a member for the past seven years in an anti-capitalist and anti-colonial organization, สูตรบาคาร่า Alliance Against Displacement. Our community organizing work has tended to focus on low-income struggles, homeless tent cities, and renter’s struggles. More recently we have started a campaign led by trans women called Bread, Roses and Hormones and a campaign against the police in the suburb of Surrey, called Anti-Police Surrey. From the first years of being involved with Alliance Against Displacement, the urban Indigenous people within the group have wanted to start an urban Indigenous campaign. We have yearned to do this, ached over it, spent many hours dedicated to theorizing what an urban Indigenous campaign would look like in the second decade of the 21st century. We met with homeless Indigenous people in tent cities. We held talking circles for self-identified Indigenous people in Vancouver. It was hard to find the spark that could sustain a movement, and that is ultimately what we hoped to build through a campaign. In the past two months of organizing Wet’suwet’en solidarity actions and support in Vancouver, I have felt a shift. We urban Native people are in the streets blocking ports, rail lines, speaking freely about our right to our land, our sovereignty, our nationhood. We are drumming and singing unapologetically, leading marches of thousands of people, some of us dressed in our traditional regalia happily standing beside some of us dressed in jeans and Wu-Tang sweatshirts. We are meeting each other spontaneously in the streets, building connections, and sharing politics. We are connecting with political elders, like Ray Bobb, who was involved with the Native Alliance for Red Power in the 1960s and 70s in Vancouver. We are meeting youth, like the young Stó:l? woman Sii-am, who spoke in the whipping wind and pouring rain just after we shut down a major transportation route in downtown Vancouver one evening. While the violence against Wet’suwet’en people, and Wet’suwet’en land, is yet another mournful example of colonialism in Canada, I also see great potential in this moment. Urban Native people are being catalyzed through the Wet’suwet’en assertion of sovereignty. We are rekindling our voices, hearing new voices, developing a more explicit politics of sovereignty that takes us into the streets. It is also important to acknowledge that other Wet’suwet’en people have reoccupied their territories over the years as well; Unist’ot’en is not an exceptional reoccupation. What is exceptional about it is that it happens to lie in direct route of multiple proposed tar sands and fracked gas pipelines, including three projects that have failed to receive consent from the Unist’ot’en. These three pipelines are the currently halted Northern Gateway Pipeline funded by Enbridge, and the in-progress Pacific Trails Pipeline funded by Chevron as well as the Coastal GasLink Pipeline funded by TC Energy. Until last week, TC Energy was known as TransCanada. They changed their name in the midst of widespread criticism and ongoing Wet’suwet’en solidarity actions across the world. Coastal GasLink/TC Energy has been constructing a 670 kilometer liquified natural gas (LNG) pipeline that would carry fracked gas from Dawson Creek, BC to the coastal town of Kitimat, where LNG Canada’s processing plant would be located. The permits for Coastal GasLink’s LNG pipeline were approved by the BC government under the Liberals. More recently, the permits were enforced by the BC government under the New Democrat Party (NDP), Canada’s party of labor which, like New Labour in the UK, has adopted “third way” neoliberal policies and has led multiple attacks on Indigenous sovereignty and land defense movements when it has been in power in BC. Whether at the hands of the Liberals or the NDP, the Royal Canadian Mounted Police (RCMP) is the paramilitary police force that has attacked Indigenous nations since the time of Canadian Confederation. The RCMP was initially founded in order to wage war against Métis, Cree, and allied non-Natives during the anti-colonial and anti-capitalist Red River Resistances in the 1870s and 80s. The RCMP was born through Indian Wars, and it continues to thrive on them. This is a profound act of Indigenous sovereignty, and it is fitting that it would be occurring in BC. Although Canada itself has never fully solved its “Indian problem,” BC’s lack of treaties is a glaring admission of violent colonial occupation.